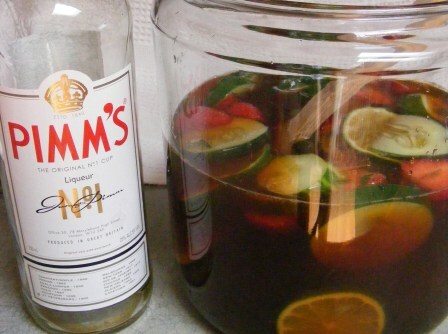 Around this time last summer, I discovered Pimm’s No. 1, a gin-based liquor made in England from dry gin, liqueur, fruit juices, herbs, and spices. The formula is a well-kept secret. It is reported that only six people in the world know how it’s made. The taste is hard to describe. It’s light, fruity, a little spicy, with a hint of cucumber (yes, cucumber). You definitely don’t have to be a gin drinker to enjoy Pimm’s. The classic Pimm’s drink, the Pimm’s No. 1 Cup, is commonly associated with Wimbledon. As with most classic (i.e., old) cocktail recipes, there are dozens of ways to make a Pimm’s cup. The “official” recipe, from the Pimm’s website, is 1 part Pimm’s No. 1 and 3 parts chilled lemonade, stirred together over ice, and garnished with one or more of mint, cucumber, orange, and strawberry. However, because British lemonade is carbonated and lemonade in the States tends to be still, many recipes call for a 1:2:1 ratio of Pimm’s, lemonade, and lemon-lime soda or seltzer. 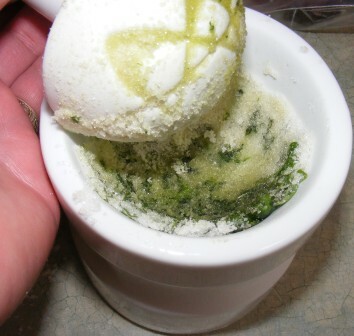 Muddle sugar and 4 basil leaves and place in large pitcher or container. Chiffonade remaining basil leaves and add to pitcher with muddled basil. Hull, wash, and slice strawberries. Add to pitcher. Zest and juice 1 lime; slice remaining 2 limes. Add zest, juice, and slices to pitcher. Slice cucumbers and add to pitcher. Pour 4 cups still lemonade into pitcher and mix well, smashing fruit a bit to release juices. Add Pimm’s and stir to mix well. 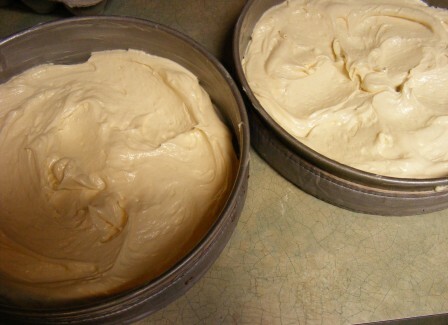 Cover container and refrigerate for at least 4 hours or overnight. Add carbonated lemonade (or remaining still lemonade and lemon-lime soda) and stir gently to mix. Serve over ice, garnished with one or more of strawberries, lime wedges, cucumber slices, or sprigs of mint or basil. Variation: Substitute mint sprigs for basil. This is the last in a series of six posts featuring (or at least including) strawberries. The strawberries were great this year, and I was having so much fun making recipes with them that I decided to host Strawberry Week on my blog. 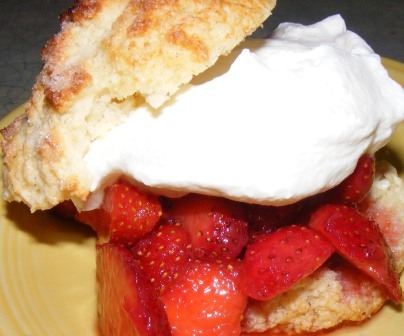 Check out the other posts from this week, including Real Strawberry Shortcakes. Sometimes the simple things in life are the best. 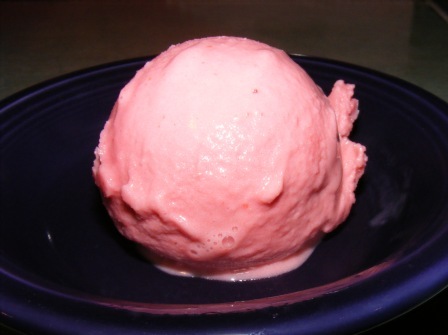 Like a simple, delicious strawberry frozen yogurt. 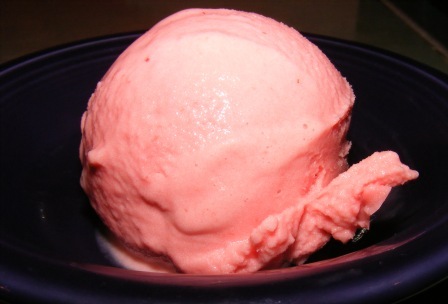 Or a simple post with a simple recipe for strawberry frozen yogurt. This recipe was inspired by David Lebovitz and adapted by me. Cut the strawberries into 1/2-inch slices and place in a bowl with sugar and Kirsch. Stir to mix well, then set aside to macerate for 1 to 2 hours. 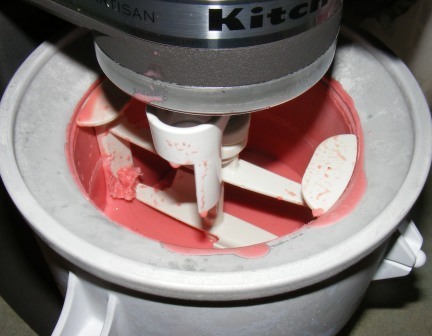 Put strawberries and their liquid, yogurt, sour cream, and lemon juice in bowl of food processor. Process until mixture is smooth. Press mixture through fine mesh sieve to remove seeds. 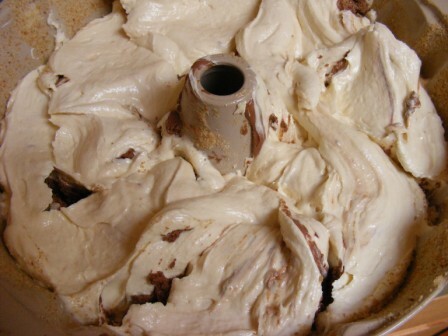 Refrigerate mixture for 1 hour, then process in ice cream maker per manufacturer’s instructions. Enjoy immediately, or freeze to desired consistency. My family loved this frozen yogurt. In fact, my wife pronounced it “too good”, meaning it won’t last long around here. It was sweet, slightly tart (my 8-year-old picked up on the lemon juice), and tasted like fresh strawberries. Everyone was surprised when I told them it had sour cream in it. I added it because the only yogurt I had was low-fat, but I ended up liking the smoothness and tang it lent to the frozen yogurt. From now on, it will be a regular addition to my homemade frozen yogurt. 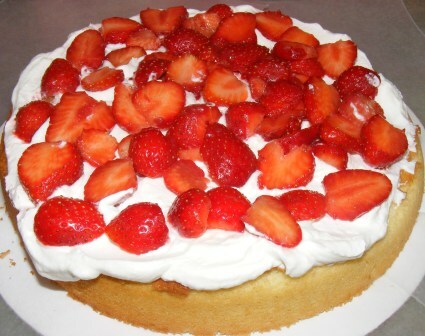 This post is part of Strawberry Week here at Of Cabbages and King Cakes. 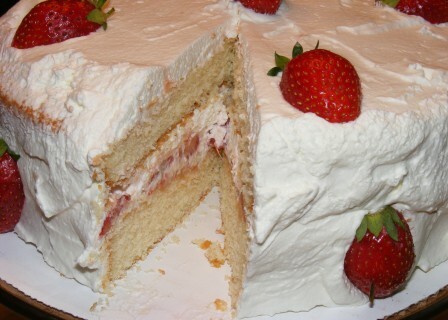 Check out my other posts to find out what else I did with fresh strawberries while they were in season this year. We’ve been getting some beautiful strawberries this year and using them as many ways as we can. We’ve eaten them whole, sliced, and macerated, and I’ve made a number of desserts featuring fresh strawberries. 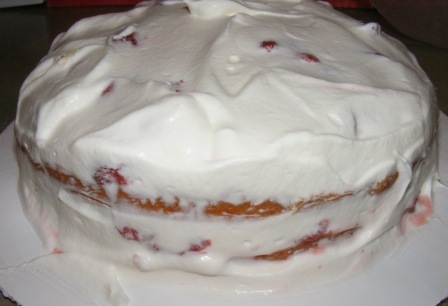 There are a number of recipes I would like to remember for future years, so, I’ve declared this week “Strawberry Week” on my blog and invited my blogging friends to join in. 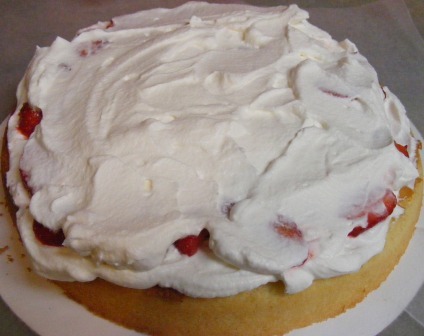 Two recipes I made (and the base for a third) happen to be from the Cakes section of the Modern Baker Challenge, including this one for a simple, classic strawberry shortcake. 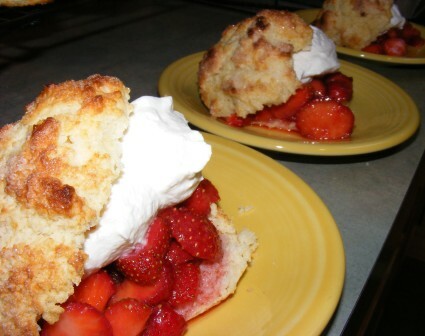 As with most strawberry shortcakes, this recipe consists of three components: shortcakes, macerated strawberries, and whipped cream. For the strawberries, I hulled, washed, and sliced them, then mixed them with sugar (it didn’t take much, as these were height-of-the-season, super sweet strawberries). I set them aside to macerate while I made the shortcakes. 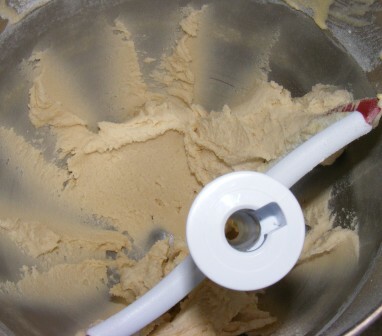 I began by mixing flour, sugar, baking powder, and salt in the bowl of my food processor. 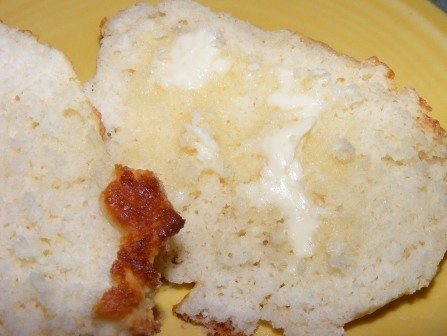 I added cold butter and pulsed until it was finely mixed in. 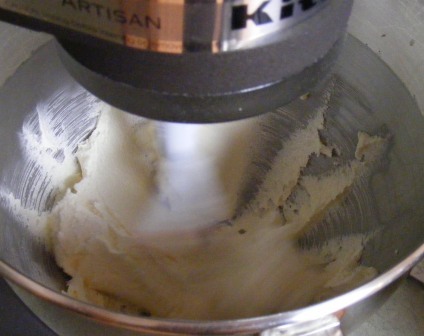 I whisked egg and buttermilk together, added them to the food processor, and mixed until I had a soft, wet dough. 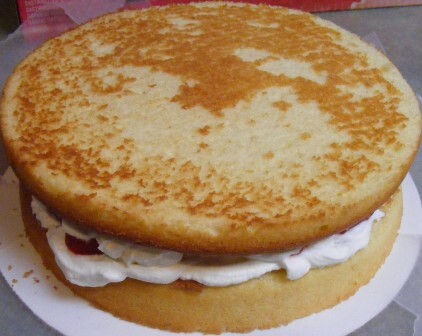 The recipe presents two options for the shortcake. 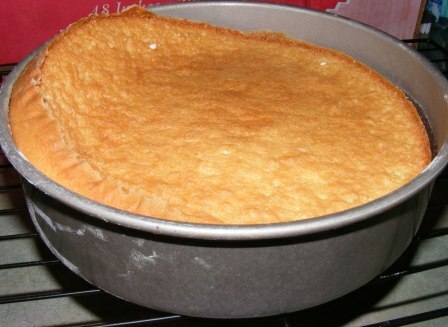 It can be made as a single cake in an 8-inch round pan, or baked as individual shortcakes by mounding the dough on a baking sheet. I opted for individual shortcakes. 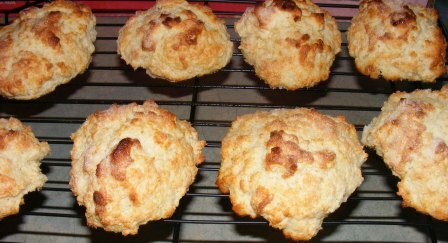 I baked the shortcakes for about 15 minutes, until they were firm and lightly browned. While the shortcakes were baking, I whipped heavy cream, sugar, and vanilla extract with the stand mixer. After the shortcakes had cooled enough to handle, I cut them in half, buttered them, and assembled the shortcakes. 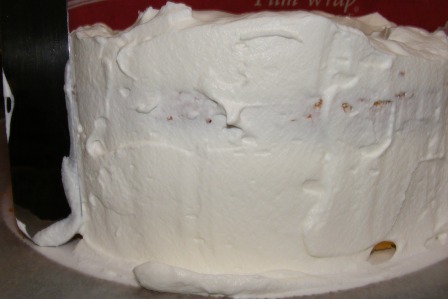 Each shortcake consisted of a buttered shortcake half, topped with strawberries and whipped cream, and finished with the remaining shortcake half. If strawberries are the perfect fruit, then these may be the perfect dessert. 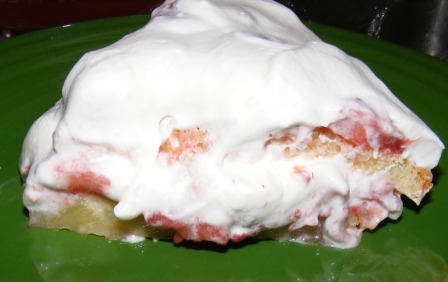 The shortcakes and whipped cream accent the strawberry flavor without overshadowing it. And did I mention that start to finish this recipe takes less than an hour to prepare? After yesterday’s success with half hour hamburger buns, I decided to try the recipe again, this time as hot dog buns. It’s the same basic recipe. I changed the shaping instructions and rewrote it to make by hand instead of with a mixer. Preheat oven to 425°F. Line baking sheet with parchment paper or Silpat. Pour water into a large bowl. Add yeast and sugar, stir to dissolve, and allow to rest for 5 minutes. 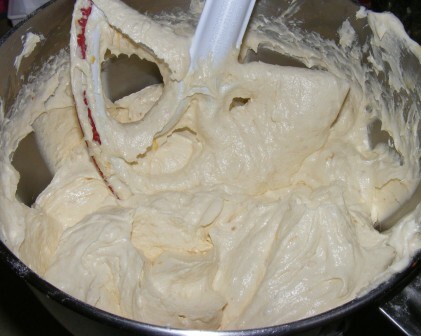 Add remaining ingredients and mix with dough whisk or large spoon. Turn out onto a lightly floured surface and knead for 3 to 5 minutes, adding flour as necessary so that dough it smooth and elastic, like French bread dough. Divide dough into 12 equal pieces and preshape each piece into a ball. Working with one dough ball at a time, flatten into an oval. 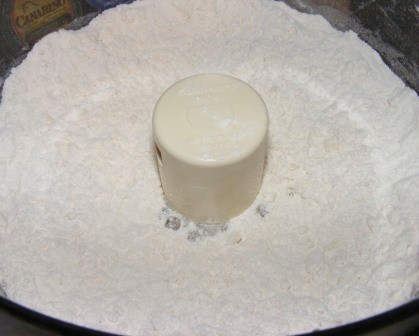 Fold top third of dough to the center, seal, then fold down again and seal into a torpedo shape. Using both palms, roll from the center to the ends to desired length. 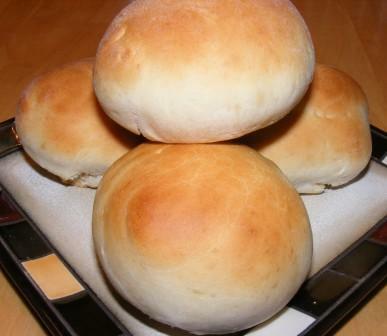 Place dough balls close together (about an inch or less apart) on prepared baking sheet. Cover and let rest for 10 minutes. If desired, brush rolls with water and sprinkle with sesame seeds just before baking. 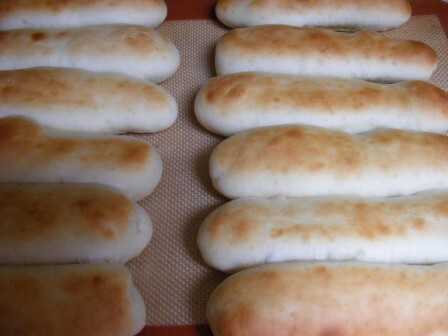 Bake rolls for 8-10 minutes, until well-risen and browned. Cool on pan for a few minutes. Makes 12 hot dog buns. I don’t know about you, but Mondays and Fridays tend to be quick dinner nights around here. For whatever reason, at either end of the work week, I want something simple and fast to throw together. One of my almost instant dinners that my family really likes is Sloppy Joes. So last night (Thursday), I got a pound of ground beef out of the freezer to make Sloppy Joes for dinner tonight. There weren’t any hamburger buns in the freezer, and the ones on top of the fridge were of questionable vintage. Rather than stop on the way home to pick up buns, I decided to try a recipe a number of my baking friends had been chatting about — Taste of Home’s 40-minute Hamburger Buns. You might wonder (1) how you could possibly have homemade bread of any kind in about half an hour, and (2) whether it could possibly be any good. Let me tell you…. Bread derives its flavors in two basic ways. 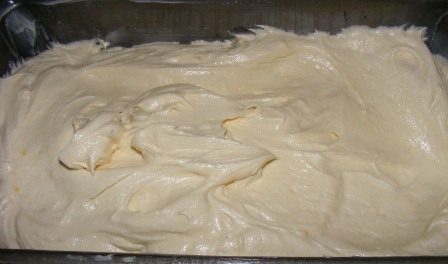 First, from time — the rising and fermenting processes allow the yeast in the dough to convert the starch in flour to sugar, thereby adding flavor. The other way to get flavorful bread is through the ingredients used to make it. For example, eggs, sugar, and oil are often added to bread to make an enriched dough that relies more on these ingredients than the fermentation process for its resulting flavor. In the case of these burger buns, the flavor comes almost entirely from the ingredients, as the dough is not given a chance to rise. This recipe also relies on another principle of bread baking: if you add enough yeast to the dough, you can make bread that rises “instantly”. I’ll admit to being a bit skeptical of these buns, as I tend to rely heavily on time to develop flavor in my breads. I can make amazing bread using nothing but flour, yeast, salt, and water (and in the case of sourdough bread, just flour, salt, and water). But I needed hamburger buns for dinner, and it seemed like a good time to see what all the fuss was about. I was surprised at how good these burger buns tasted. I would still opt for a more traditional recipe when time permits. But for an almost instant bread, these were great. And they fit right into my quick Friday dinner plans. These were so good, I made them again as hot dog buns. I made some changes to the recipe, and I found they were done in closer to half an hour than 40 minutes. Here’s my version. Pour water into bowl of electric mixer. Add yeast and sugar, stir to dissolve, and allow to rest for 5 minutes. 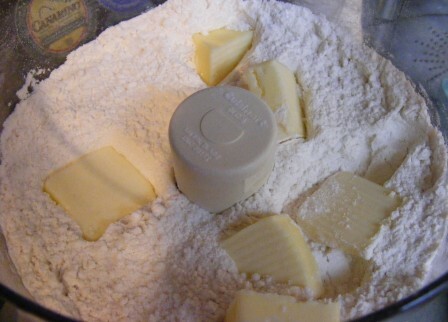 Add remaining ingredients and mix with dough hook on medium-low speed for 3 to 5 minutes, adding flour as necessary so that dough clears sides and bottom of bowl. Divide dough into 12 equal pieces and shape each piece into a ball. 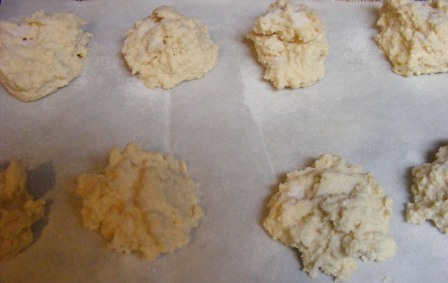 Place dough balls 1 to 3 inches apart on prepared baking sheet and flatten slightly. 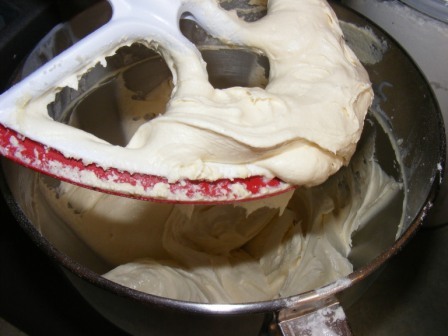 (Placing dough balls closer together will cause them to bake together, creating pull-apart hamburger buns similar to those you get from the store.) Cover and let rest for 10 minutes. If desired, brush rolls with water and sprinkle with sesame seeds. Or for softer buns, brush with a little milk. I was all set to make this recipe the other day when my friends Kayte and Margaret tweeted that they were making it, too. So we decided to have a Twitterbake and make it “together” in our separate kitchens (and separate States). It’s always more fun baking with others, even if you are baking and tweeting from far away. This is the third recipe in the Cakes section of the Modern Baker Challenge. After starting with a delicious, if fussy, pound cake, I was looking forward to trying this recipe. As impressive as it looks, this cake was really easy to put together, although it did dirty quite a few bowls. The base batter consisted of flour, sugar, baking powder, salt, butter (three sticks! ), seven eggs, and dark rum. 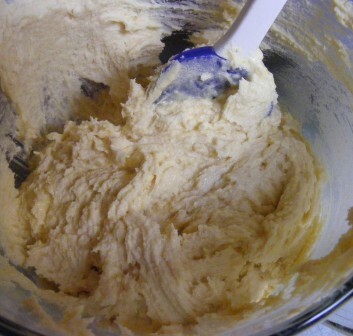 After making a heavy paste of the dry ingredients and butter, I whisked the eggs and rum, then added them to the butter mixture. 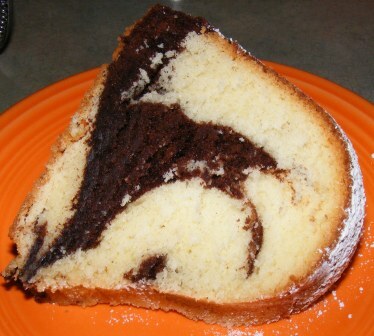 The chocolate swirl layer consisted of dark rum, milk, baking soda, bittersweet chocolate, and two cups of the base batter, all mixed together until blended. 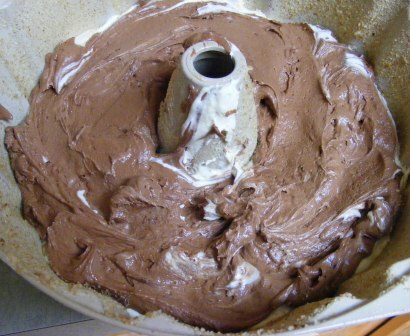 To assemble the cake, I put half the base batter in the pan, smoothed the top, then topped it with the chocolate layer. I covered this with the rest of the base batter, smoothed the top, then marbled it by dragging a knife through the batter from the center to the edge all the way around the pan. I baked the cake for 75 minutes, until it was done through but still moist. Pardon the pun, but the cake smelled intoxicating while it baked. The chocolate and rum combined to give it a rich, heady aroma, and I couldn’t wait to cut into it. 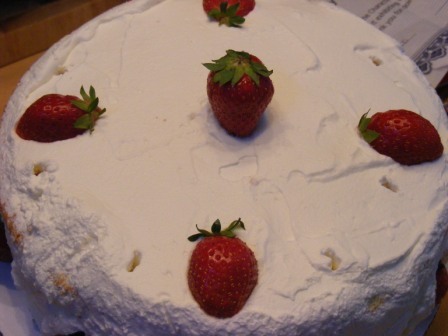 I let the cake cool, then sprinkled the top with powdered sugar (although it really didn’t need any adornment). My daughter and I decided to sample it for a bedtime snack. I was planning to take the rest of it to work today, but after tasting it, my daughter announced that I would be doing no such thing. The cake was rich, but not overly sweet, and had a great balance of flavors. Calling it “rum-scented” is quite apt, as the rum adds more to the aroma than the flavor. This was another great recipe from The Modern Baker and has me looking forward to the next seven months(!) of cakes. Check out Kayte’s and Margaret’s posts to see what they thought and to get a look at their beautiful marbling. 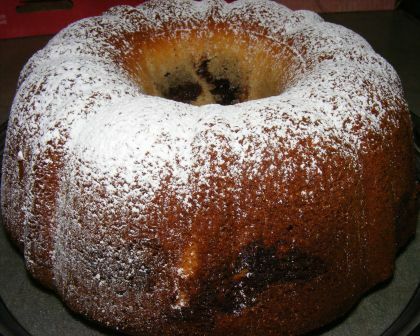 The first entry in the Cakes section of The Modern Baker is a recipe that Nick Malgieri got from his aunt. Even though I don’t bake the recipes in each section strictly in order, I do at least like to start at the beginning. 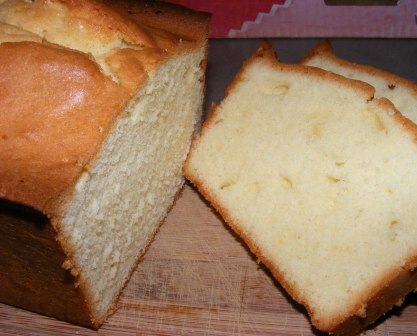 And this time, that was easy to do, as I love pound cake. 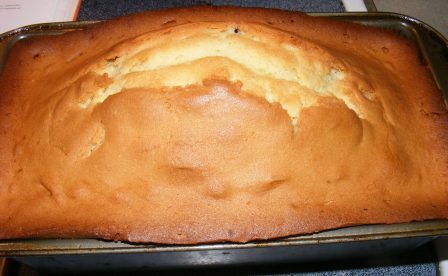 I have made two of Nick’s other pound cake recipes — New Orleans Praline Pound Cake (pralines being another love of mine) and Vanilla Bean Pound Cake. Both of these recipe were from Nick’s more recent book, Bake!, and both were easy and delicious. This recipe was a bit more complicated, but promised to be worth the effort. 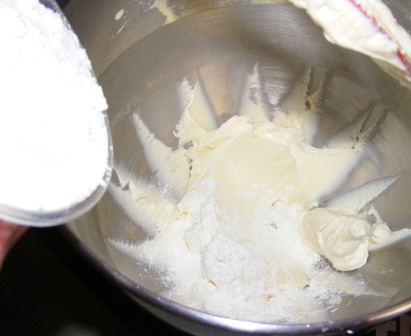 What makes this batter more work to make is the mixing method. 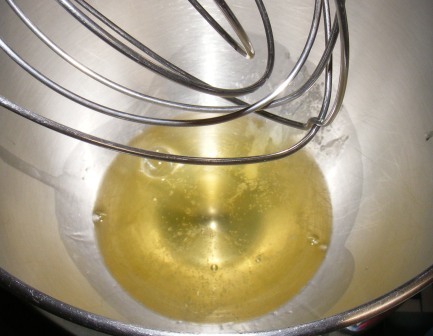 First, egg yolks are whisked by hand, then sugar is whisked in slowly, followed by vanilla and lemon extracts. 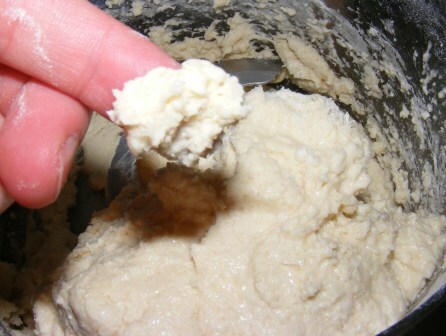 This mixture is then beat with a stand mixer until it is light and well-aerated. While the egg yolk mixture was whipping away, I mixed the dry ingredients — cake flour and baking powder. Or I would have, if there had been any cake flour in the cupboard. But there wasn’t. So I made my own. If, like me, you ever find yourself lacking cake flour for a recipe, don’t despair. And don’t run out to the store. It’s easy to make a perfectly acceptable substitute for cake flour using all-purpose flour and cornstarch. 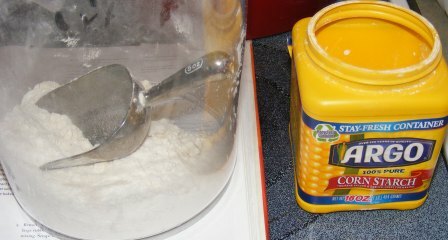 For every cup of flour in the recipe, measure 2 tablespoons of cornstarch into a 1-cup measure. Fill the rest of the way with AP flour. That’s it. 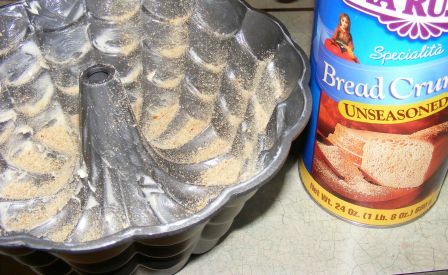 Just use it in place of 1 cup cake flour, and you’re all set. Now, where were we? Oh, yes. We just finished beating the egg yolk mixture. I scraped the mixture into a large bowl, then, without washing the mixing bowl, beat the butter for a minute to lighten it. 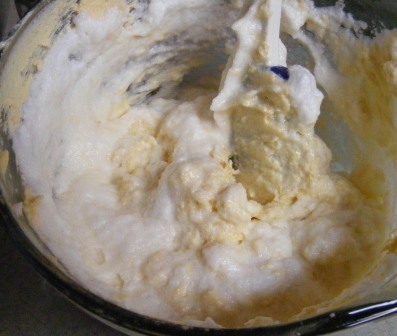 Then I added the flour mixture to the butter and beat until it made a smooth paste. 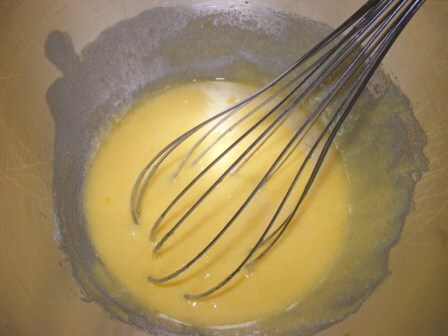 I scraped the butter-flour mixture over the egg yolk mixture and stirred it all together with a rubber spatula. 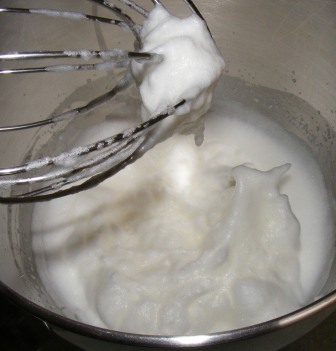 Then, I had to wash the mixing bowl in hot, soapy water, as the next step was whipping egg whites, which wouldn’t work unless the mixing bowl was perfectly clean. I beat the egg whites to a firm peak. Now. to the tell the truth, I don’t really understand the whole whipped egg whites thing in this recipe. After carefully beating the whites to just the right consistency, you usually continue to treat them with care, folding them gently into the batter and being careful not to break them. Not so with this recipe. 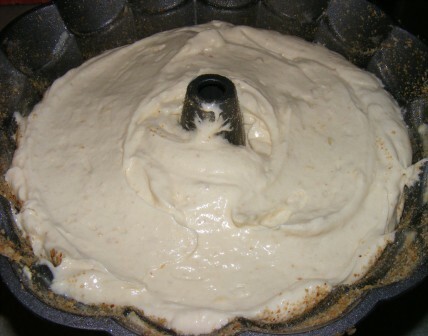 After beating the whites, they are unceremoniously stirred — not folded, stirred — into the batter. And if that wasn’t bad enough, the whole thing is then returned to the mixer and beat — yes, I said “beat”, sir — for 5 minutes. This seemed to completely destroy the integrity of the egg whites. But I have to admit that the resulting batter was light, airy, and beautiful. I baked the pound cake for about an hour, which, incidentally, was about how long it took to wash all the dishes this masterpiece created. It smelled great baking and came out of the oven looking great. 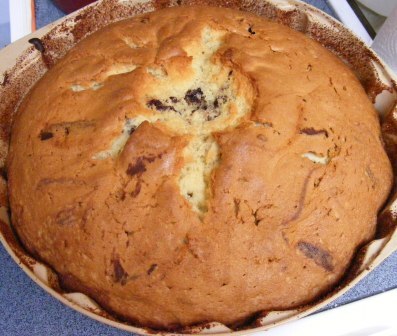 I cooled the cake in the pan for about 5 minutes, then unmolded it and let it cool before slicing into it. 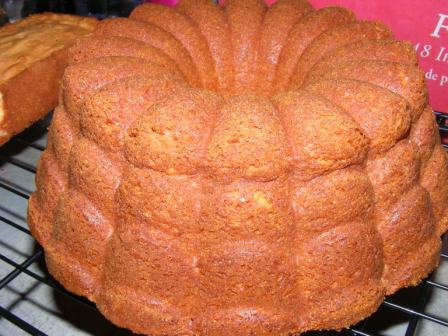 Many people will tell you that pound cake is best if it is allowed to dry out for a day or so. That may well be true, but I’ve never put it to the test. I’m doing well if I can wait until it cools. Or mostly cools. Or cools to the point that it won’t burn my fingers and tongue. 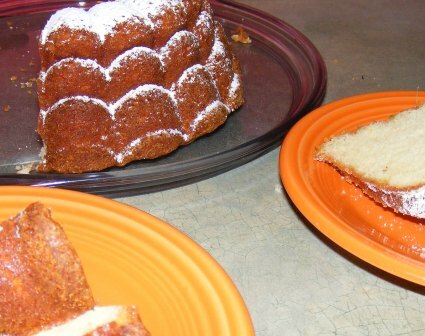 So, how did this fussy pound cake stack up? It was good. Really good. No, it was delicious. Rich, buttery, with a moist crumb and just a touch of lemon flavor. I ate it warm, cold, and toasted the day it was made and over then next several days. I thought about serving it with crème anglaise on the third or fourth day, but it didn’t last that long. 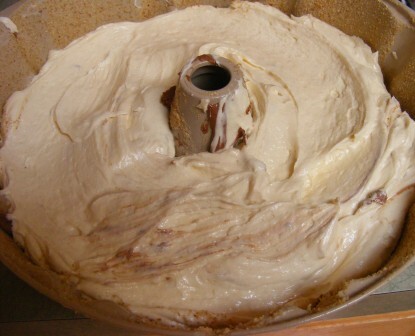 However, even though this was a great pound cake, I don’t see myself making it again. 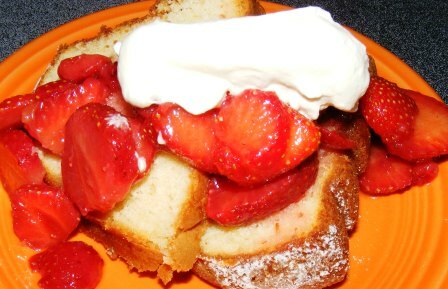 As delicious as it was, it wasn’t that much better than other pound cake recipes that are half the work. I might use the ingredients and proportions from this recipe with a more modern, quicker mixing method. Now, that could be a winner. 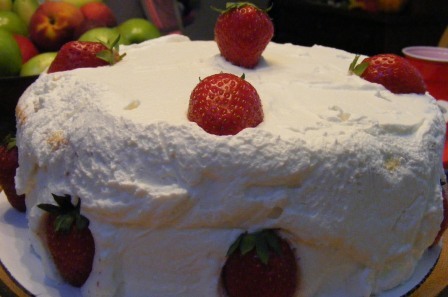 This post is the first recipe in the Cakes section of the Modern Baker Challenge. Check out the Challenge page to see what the other bakers are up to this week.